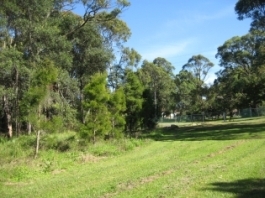 Equatica was commissioned by Hurstville Council to design and supervise creek rehabilitation works in a bushland reserve south of Oatley train station. Over time the channel has eroded and changed course. Restoration and stability works are required to prevent large volumes of sediment being released into sensitive areas downstream. The reserve has limited access for construction and delivery vehicles. Soft engineering works were designed to be built by hand and using small excavators. Bicentennial Park wetland suffers from high nutrient concentrations, frequent algal blooms and weed infestations. Equatica analysed water quality data for the site and realised that nitrogen concentrations were unusually high, even for an urban water body. Data analysis suggested that landfill leachate was seeping into the wetland from an adjacent site, and this finding informed our design and management response. Rather than simply trying to improve flushing, circulation and water quality within the wetland, we recommended several options to reduce the nutrient loads moving into the wetland from the landfill site. 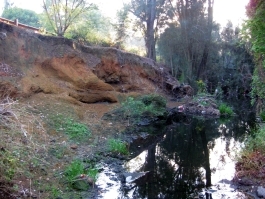 A small creek crossing Crestwood Reserve in Baulkham Hills was undergoing massive erosion after a high flow event exposed the sediments below the topsoil. The safety of park users was a concern as the creek banks had become steep and deep. 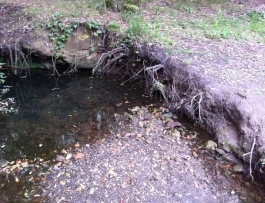 Adjacent to the creek a Sydney Water sewer was also threatened by the expanding creek erosion. Despite an apparently gentle grade, active erosion was noted to be occurring in other locations. After hydraulic modelling of the creek, a number of hydraulic jumps were found to occur in the vicinity of the scour and erosion locations. A number of check dams were prescribed to suit Council's preference for small level changes in the park landscape. 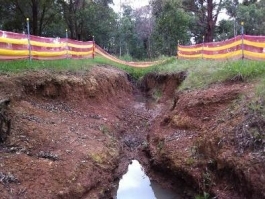 Equatica designed and documented creek bank stabilisation works for a 30m reach of Orphan School Creek. Site analysis revealed that the creek had been locally shortened and steepened, causing bank full flows to approach critical depth and velocity conditions. 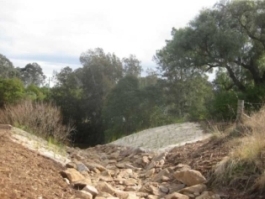 Highly reactive sodic clays were exposed during a high flow event and continued to erode, causing a public safety issue and threatening local infrastructure. Hydraulic models and geomorphologic methods were used to determine the mode of creek bank failure and design stabilisation works. 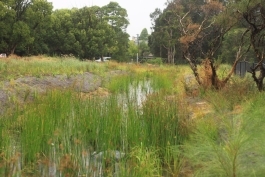 As part of this project, Equatica also designed and documented a drainage feature within Goodacre Reserve (adjacent to the creek) to increase the biodiversity, filter stormwater and draw pedestrians into the creek corridor from the adjacent road. 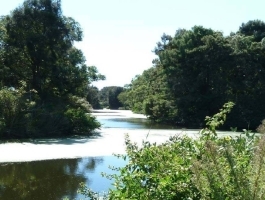 Yeramba Lagoon is a man-made freshwater lagoon adjacent to the Georges River. The site was previously a tidal arm of the estuary, but the construction of a weir in the 1960s formed the freshwater lagoon. In the past few decades, water quality has declined, aquatic weeds have taken hold and habitat value has declined. Bankstown Council and National Parks aim to restore tidal flushing to the lagoon, and this project involved the exploration of concept design options to modify the weir and restore estuarine habitat. Equatica has delivered a concept design and restoration strategy which allows for future adaptive management at the site. This project will restore a small tributary of the Cooks River, where the existing channel is significantly degraded. Equatica developed concept and detailed designs for a constructed wetland, with a dual habitat and stormwater treatment function. The wetland will treat stormwater from two local residential catchments, and also control alligator weed in the drainage channel. Hydraulic modelling and catchment analysis was undertaken to understand water level variation and the inundation regime for the wetland. The plans also included key design considerations to create habitat for green and golden bell frogs. Equatica prepared a rehabilitation and Water Sensitive Urban Design concept plan for the village of Milthorpe. The plan presents an analysis of opportunities and constraints within Milthorpe, as well as concepts and parameters for riparian improvement works. 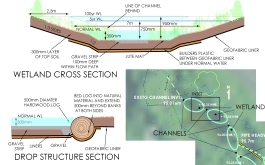 Conceptual channel works include the establishment of a chain of wetlands or swampy meadow style waterway that is stable under urban runoff conditions and provides stormwater quality improvements. Equatica worked with Sprout and Ron Flew Excavations to design and construct stream rehabilitation works at a small tributary of South Creek in St Marys. The works addressed a highly unstable 3m head cut, which was actively eroding during the design process. Through close consultation with Council, a rock ramp was designed to deliver flows to a stilling basin formed at the base of a boulder wall. Excess spoil from the stabilisation works was worked into the landscape to avoid costly disposal off site. Stripped and stockpiled top soil was then reinstated and heavy duty jute matting was applied to control weeds on exposed batter slopes. The channel sides were planted out with species from the Cumberland Plain Woodland ecological community. 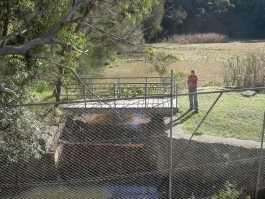 Equatica worked with EcoLogical Australia to develop a concept plan for rehabilitation of Strangers Creek. The concept plan includes stormwater quality treatment, bank protection works, improvements to access tracks for emergency vehicles, weed removal and revegetation. The concept plan was summarised in a poster and was presented to a local community workshop.